ForexBoat is an online Trading Academy whose goal is to provide Top Forex Trading Education and help Students to build a strong knowledge of the Forex Market. Will I make millions after taking these courses? Not guaranteed but with commitment, practice and consistency, you may achieve good results in ForexTrading. What is the difference between Student Plan and Trader Plan? The Trader Plan has exclusive access to our Webinar Library where you can replay the webinars the times that you want. How much will a membership get me? 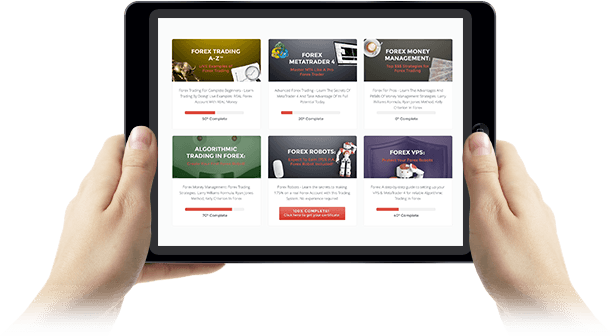 You’re paying for world-class Forex, MQL4, Money Management, Expert Advisors and Metatrader 4 Courses. Plus, access to live Monthly webinars where we will share additional Trading Tools and hacks. Finally, you will be part of our exclusive Trading Community where you can discuss different topics related to Forex Trading. Is this another Forex Scam? No, we are not a get-rich-quick scheme and we do not promise guaranteed results in Forex Trading. What I can say is that with consistency, hard-work, knowledge and patience, you will have a probability of achieving good results. How often will I get a new Webinar? Which topics will be covered in the Webinars that are different to the Courses? The Webinar will cover different types of topics that will serve as a complement to the courses. What kind of social media do you have? We are on Facebook, Twitter and LinkedIn. Is this a social trading platform? No, we have a trading community to share and discuss Trading insights but without actual operations/transactions being involved. Can I get trading signals in this group? YES, ForexBoat Pty Ltd is a Corporate Authorized Representative of HLK Group Pty Ltd which holds an Australian Financial Services License (AFSL no. 435746). We are here to answer any questions you may have about ForexBoat. Reach out to us and we’ll respond as soon as we can.